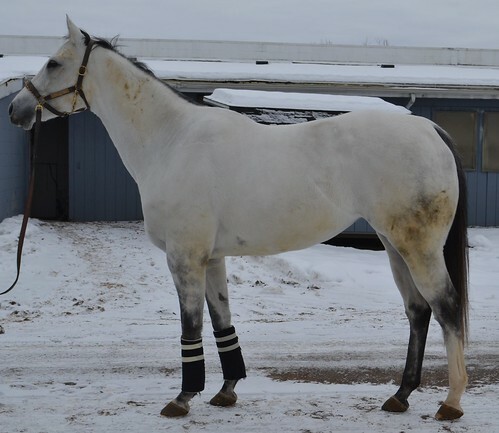 This solid bodied, pretty mare is described as really sweet, and lovely to ride. 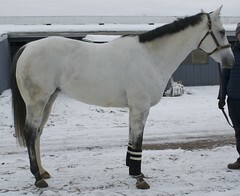 Her trainer, who is also her exercise rider, says she has a good work attitude and likes to do what you ask her to do. He says she is very sound, just not much of a race horse. She has two wins in 18 starts, and recently has not been competitive. Greta had already been done up in wraps (standard procedure) by the time we got to her barn for photos, but the trainer says her legs are clean under the front wraps. Greta stood perfectly and quietly, with an alert expression, on a bitterly cold day that had other horses jumping out of their skin. 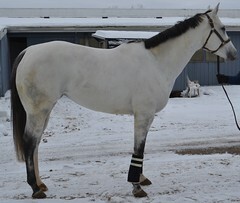 She jogged politely on icy pavement, and displayed a lovely light flat kneed trot that should get attention in the show hunter ring. Her trainer says her only quirk is that she is scared of ice cubes (we did not hear the story that led him to learn that! 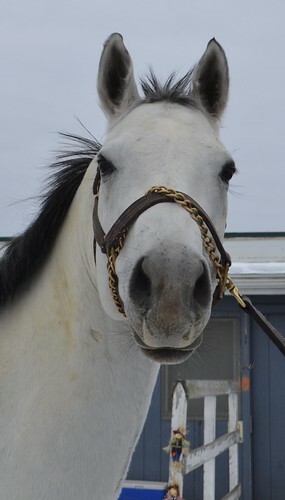 ), but she bravely encountered the icy path that led out of her barn. Greta is a Massachusetts bred daughter of Zong, who is a son of Unbridled’s Song that sold for $1.7 million as a yearling. Her dam is by Gulch out of a Grey Dawn mare.